Mastering Bird Photography: The Art, Craft, and Technique of Photographing Birds and Their Behavior. Acclaimed bird photographer and author Marie Read shares techniques and stories behind her compelling images. She offers fresh insights into making successful bird photographs, whether you’re out in the field or in the comfort of your own backyard. In this richly illustrated book, you’ll learn how to be in the right place at the right time and how to obtain tack sharp portraits. Marie then teaches you to take your skills to the next level in order to capture action shots, illustrate birds in their habitats, and portray birds in evocative and artistic ways. 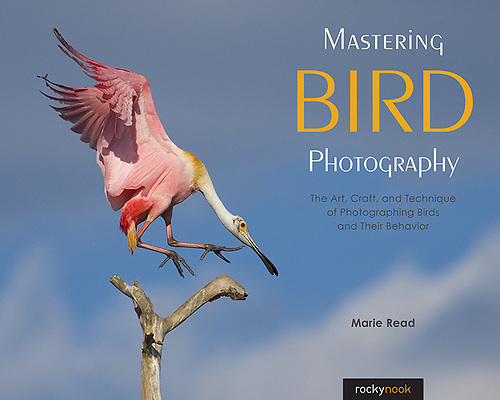 Building on basic technical topics such as camera choice, lens choice, and camera settings, Marie reveals how fieldcraft, compositional decisions, and knowledge of bird behavior contribute greatly to a successful bird photograph. Captions for the over 400 images contained in the book provide details on the equipment used, as well as camera settings. Throughout the book, bird behavior insights provide bird photographers of all skill levels a wealth of essential insider information that will help you produce images that stand out from the crowd.